I am not a breakfast person but encebollado in Canoa, Ecuador is changing my mind about eating before soon. It’s not all that surprising as I don’t like sweet food. I could care less about pancakes, muffins or french toast. My friends often drag me out as I hate going for brunch unless I can also order lunch. I would much rather have a sandwich over mushy scrambled eggs. I love poached eggs – but over asparagus or a salad instead of hash browns. But not everywhere in the world. I have such fond memories of soup for breakfast in Vietnam. And I thought it was the best breakfast ever – until now. Encebollado is a pickled onion fish soup and one of Ecuador’s national dishes. Served with plantain chips to break into the soup, encebollado usually has albacore tuna but some places mix it up with other fish or seafood. At $1.25 a bowl I’d choose this soup over pancakes any day. 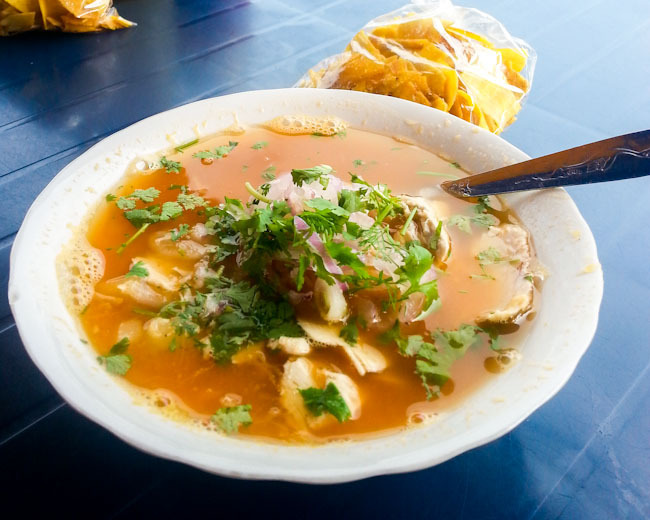 Encebollado is also known as a hangover cure and people swear by it. I wish I had known this a few mornings ago when I was suffering from a night of too many caipirinhas. Whether it works or not I’m starting to see that the food on the coast can be quite different than in the Andes of Ecuador. I may need to go on a food hunt over the next few days. PS: If you’d like to make this dish I highly recommend the site Laylita’s Recipes. Laylita was born in Ecuador but now lives in the United States. She blogs in French, English and Spanish and is by far the best site for finding authentic recipes for Ecuadorian food. Her site isn’t limited to Ecuadorian or even Latin American food, she includes recipes from around the world and you can search by country. 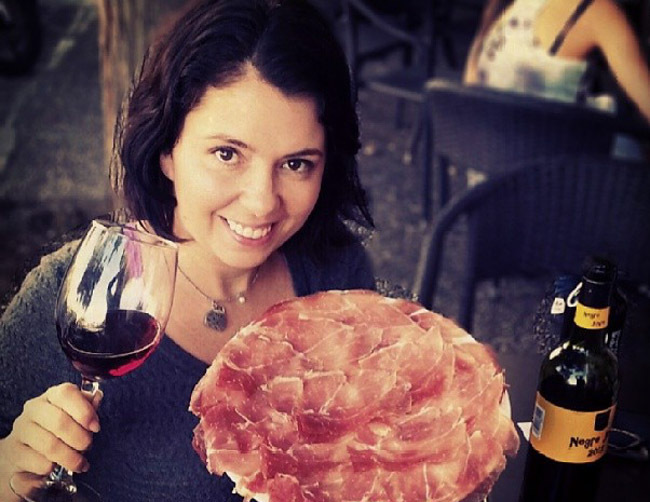 I highly recommend her site – and of course her encebollado recipe. How interesting. I prefer breakfast and breakfast food over any other meal eaten out. When I go out to lunch I tend to prefer places where I can get breakfast food. Omelets and their local variants are without question my favorite food to try when traveling. In fact, when traveling I often either skip dinner or get soup or something else really light so that I’m hungry for breakfast the next day! We are opposites! If would be happy If never ate another omelet again. Blech to breakfast! I suppose it depends a little on when you awaken in the morning. I like to get up early (obnoxiously so, according to some people) so “breakfast” really just translates to the first meal of the day, rather than something eaten directly after awakening. If I get out of bed at 04:30 or 05:00 I usually don’t eat until later (7-ish), even if I do take the trouble to have something hot to drink. BTW, there’s something awesome about the streets of Paris at 05:30 before the city awakens, but after the corner coffee bars and bakeries have sprung to life. As much as I disagree (breakfast is my fave), I love traveling Ecuador again vicariously through you Ayngelina! Breakfast is your favourite too? Who are all these crazy people who read my site. Although I must say if I had soup for breakfast every day it could possibly be my favourite meal. I have to agree with everyone else, I love going out for breakfast. And although Encebollado doesn’t look like a typical breakfast dish, if the locals swear by it as a hangover cure, I’m sold! You must be kidding, i can’t live without breakfast, my head will ache all the day. I like to eat in the morning I just would prefer not to eat breakfast food. But soup could win me over. I could definitely use some Encebollado for breakfast after waaaaay too many drinks last night. I would also love soup for breakfast rather that bread/pancakes and a hot drink. Though, soup with fish in it might be a little off for me. I only like fish fried rather than mixed with other ingredients. If you’re not a fish lover it could be a bit challenging but sounds like South East Asia could be good for you where they have other soups for breakfast that aren’t fish. I remember having fried fish with rice for breakfast with you in Peru nomnom. Although its too early to be picking out all the fish bones, I do love fish for breakfast too. They eat it a lot in Maui as well. Or at least that’s all we ate for breakfast in Maui. I am equal breakfast opportunity lover- I’ll stuff anything down as long as its good. I’ve been making heaps of banana bread, french toast, and our all time favorite of breakfast burritos with all sorts of things like potatoes, cheese, onions, peppers, chorizo, eggs, and turkey slices. I could eat that every single day. With sour cream. Ok clearly I’m hungry. Must go eat dinner now! If I can have fish for a meal I always choose that over other meat. You would choose it over pancakes!?! Wow!!! Breakfast is my favorite meal. Not a pancakes fan. Sweet for breakfast doesn’t do it for me. I’m the same way when it comes to breakfast. Well, lately I just can’t handle sweet things in general. But I’ve always LOVED soups for breakfast! It’s so refreshing and soothing for me. In Portugal, D-Man and I had ‘caldo verde’ for breakfast after a night out, heheh. And he’s totally made a Spanish version of encebollado before. I’ll definitely have him try out this recipe soon! Ooh what’s in caldo verde? I am not a breakfast person either. I am just not hungry in the mornings. People in Cambodia always eat soup for breakfast too. I can only eat soup (or any breakfast for that matter) once I have been awake for a few hours. I like to wait an hour or so then eat. I drink a lot of water but my stomach just isn’t up for food. Maybe that is why I like soup for breakfast, it’s not too heavy. Unfortunately I really like sweets and breakfast is one of my favorite meals. The soup does look delicious but I dont know if thats what I would want to eat for breakfast. At 1.25 a bowl you cant really beat the price. It’s actually good that I’m not a sweets fan. You can’t have too many vices! If the two courses are savoury instead of sweet I would be up for that. That looks amazing, I can eat that three times a day…maybe because I’m also a soup kinda guy! Me too, especially in the winter. I love squash soup. We need to eat together sometime, I think we may be food soul mates. Not at the moment, Latin countries keep calling to me. Soup is a good breakfast meal. It can make you full with just one serving. Absolutely without getting too full. The soup looks very delicious. I haven’t had that dish. I will try to recreate it on my kitchen and I do hope I can do it right. LOL. All soups are delicious even if you don’t get them right! I recently ate at a Venezuelan arepa place in Toronto and it was delicious.